I love the look of black on black. It creates a beautiful subtle saturation that attracts the eye to the subject. If you go the extra mile and add heat embossing into the mix you have a classic and elegant effect. For this card, I used black embossing on a black background with some beautiful contrasting white elements on top. On the background, I added a little element of surprise in the form of texture and pattern. Take a look at how I created the effect. For this project you will need the Memento inker. If you cannot find the inker at your local craft store then search for it online. It is a great investment to your craft stash. 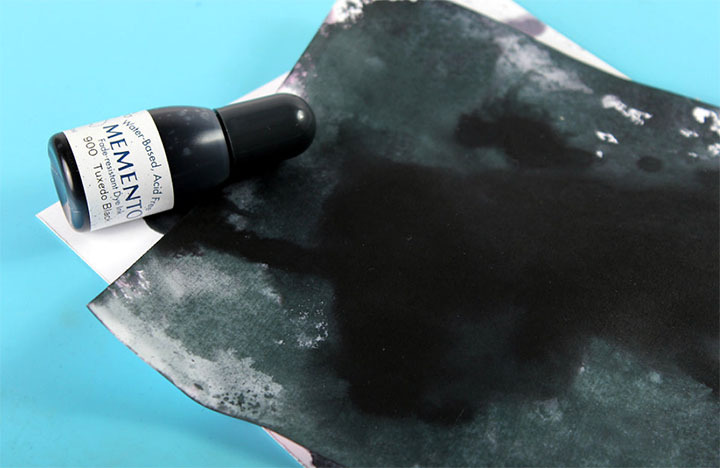 Add a few drops of Memento Ink in Tuxedo Black directly onto a piece of white cardstock. The drops are very dense so it will darken the paper rather quickly. 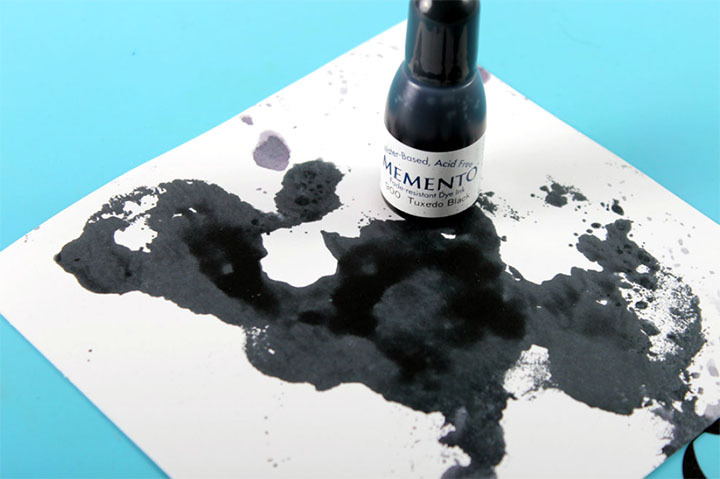 While the ink is wet turn over the cardstock piece and smudges the ink on your craft mat. Add a few more drops of ink onto the background and then mist with water to make it spread out. You will have darker and lighter patches on your background. 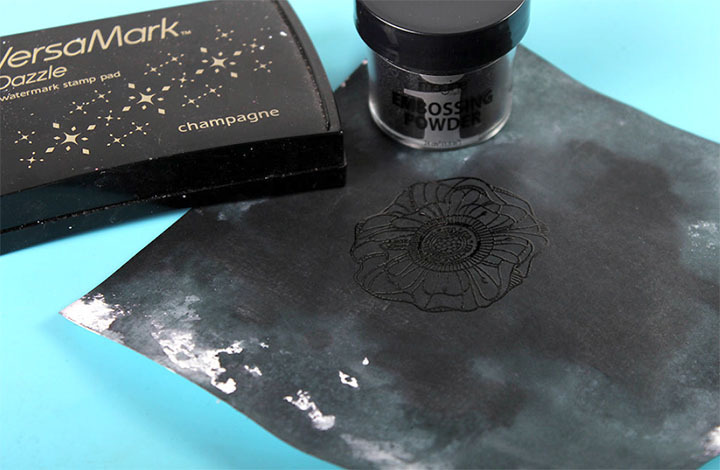 Once the background is completely dry, stamp the flower stamp with VersaMark and heat emboss using Imagine’s Embossing Powder in Black. Emboss a couple of extra flowers using the same embossing powder onto white cardstock. Cut out the flowers and set aside. 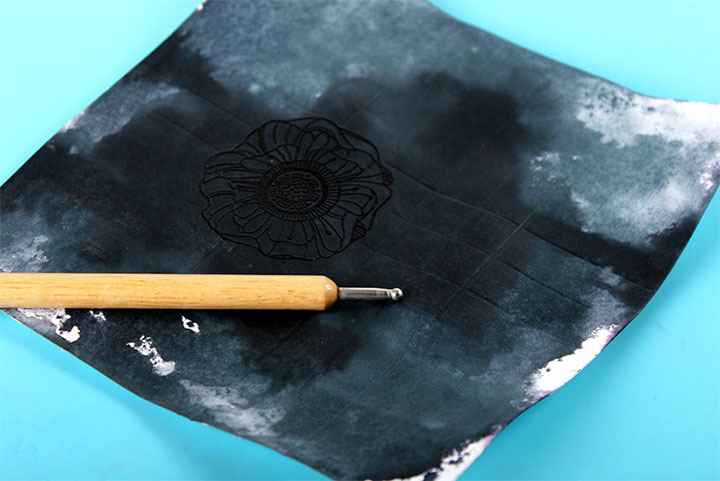 Use a burnishing tool and emboss a pattern onto the background around the embossed flowers. As you can see in the photo above, I lightly embossed a grid like pattern on the paper. Avoid the grid-like embossing over the flowers otherwise, you will damage the surface of the embossing. Use Irresistible Tuxedo Black to add a few black dots where the embossed gridlines meet. This creates an interesting effect and tone on tone look. The shiny texture of the Irresistibles liquid easily matches the embossing powders shiny surface. Finish the design by attaching a sentiment that expresses what you would like. I choose the sentiment “Memorable”. Adhere the extra embossed flowers and an extra embellishments. Thank you for stopping by! Please comment below or share on social media! This entry was posted in 2018 ARTIST IN RESIDENCE, Cards, DIFFICULTY LEVEL, DIY, INSPIRATION, Intermediate, Jowilna Nolte, PROJECTS, Techniques and tagged cardmaking, Cards, DIY, DIY Inspiration, Embossing Powder, Memento, Memento Ink, Paper, Paper Crafting. Bookmark the permalink.